Rams going back to blue and white? The team will remove the color gold from its logo set, reducing them to just blue and white, Paul Lukas of Uni Watchconfirms. Interesting. I didn't think this would be happening until the new stadium opens in 2019, but I wonder if the plan might be accelerated because of the Chargers' move and a desire to distinguish the teams' color schemes. Guess I might be shopping for new jerseys soon. I've seen this on Twitter as well, Nick. To be honest, it makes me kind of sad. Obviously I'm a younger Rams fan, and to me and in my lifetime our identity was the gold and blue. It was one of the reasons I became a Rams fan. I like the blue and white and it is a clean look, but gold is so deeply enriched in our history and it means so much to me. It'll be tough completely axing the gold out of our existence to be honest. Does this indicate a timeline? 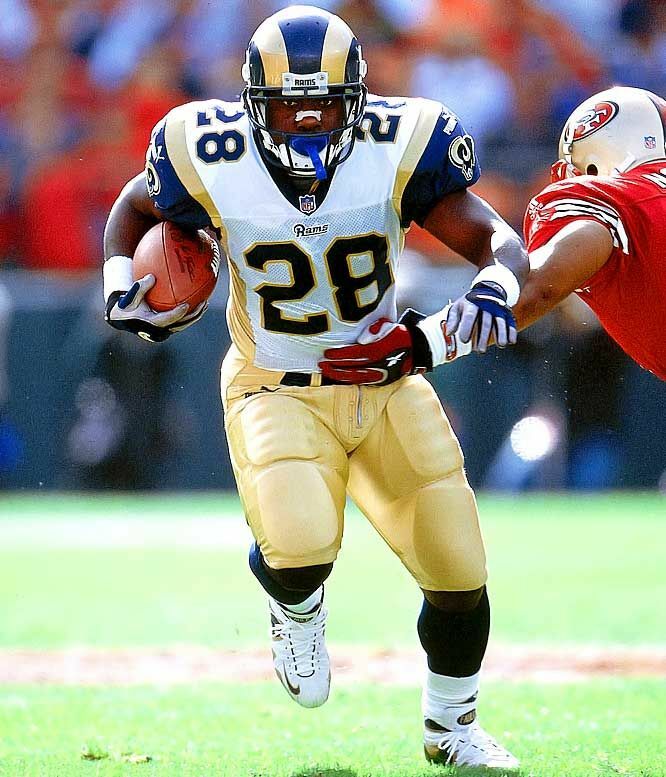 I know that the RAMS have to give a certain amount of notice (time wise) before any uniform change. I hope this is an announcement, indicating that the change was previously submitted. While I too have an affection to the Blue and Gold (both versions), I really like the Blue and White schemes better. I've seen this coming for awhile, even as far back in St Louis with the endzone. I think it's a smart play from a branding stand point, the team needs to start a new era. It's can't live in the past and on past glory (70-80-00). I think the throw backs will be the Blue and Gold and the White and Blue will be the new colors. Last edited by Rambos; -02-03-2017, 10:22 AM. Who knows what this means as far as uniforms, or any time line, but the writing has been on the wall for a while indicating a color change. There has been no official announcement, but I've noticed the official Rams site has been using blue and white graphics with no gold for some time now, the set of Rams Report does not have any gold on the logos, and the backdrop for press conferences uses only the blue and white color scheme. It'll be interesting to see if new uniforms are coming in 2017, or if the gold is going to be transitioned out, with a new uniform design coinciding with the opening of the new stadium. I think we all just about knew what was going down when the Rams not-so-subtly changed the end-zones back in St. Louis and carried over to LA. KD said this awhile back. But Demoff said the team would not apply for a change until 2017, putting it on track for implementation in 2019. If we're going to kick it old school, let's go all the way to the red and black. This Tolkien verse seems to apply (with a bit of hope) to the Rams relocation and (reported) color scheme change, does it not? Not surprised. They've been dropping subtle hints all year with the blue and white logo being featured on the backdrops during press conferences and what not. Even the Rams pin that Sean McVay was wearing during his introductory presser was blue and white. I too will miss the gold horns on the helmet because I always thought it looked pretty clean but I understand being back in LA you want to go back to your roots. The change to gold happened only in St. Louis so they're going to want to leave that behind going forward. Just don't butcher our uniforms and I'll be fine with it! Last edited by Bald_81; -02-03-2017, 04:52 PM. That's interesting. I go back to Blue and White, so I love the change. And it just looks better. But, look at it this way, we've got to change from these current uniforms. They are emblems of alot of terrible football and some of the most painful seasons. They adopted them in 2000, as the champs. Lost the Super Bowl in 2001 in them, a blow from which the franchise still has not recovered. 111-160-1 in these uniforms. I say burn them. But the blue and yellow predecessor was nice, and we won the Super Bowl in that uniform. I would take that one too, but classic blue and white is the best choice, IMO. I wouldn't mind just a little black in there too.